Every day, millions of people search on Google for businesses like yours. 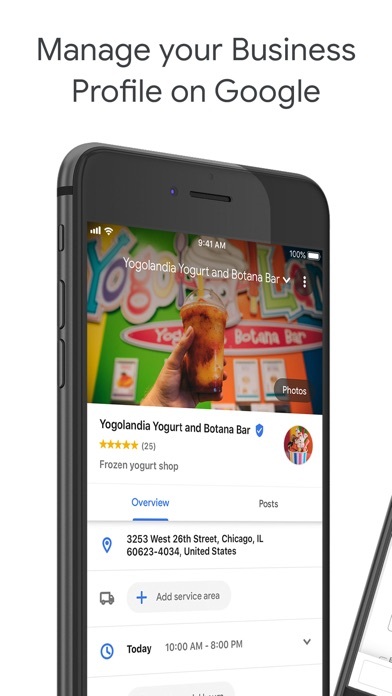 Make your Business Profile on Google stand out for free and turn those searches into your customers with the Google My Business app. 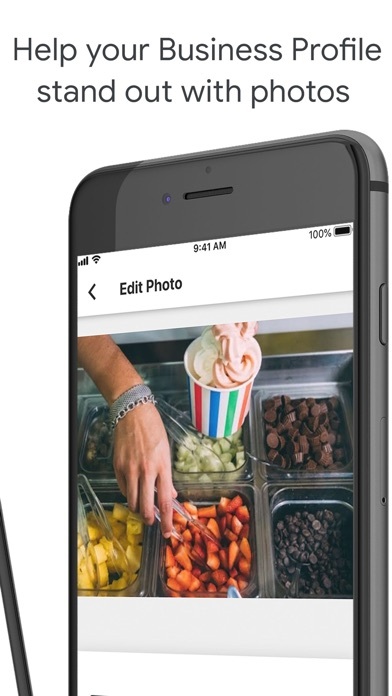 More than just a local listing: - Make edits to your Business Profile on your phone and see those changes online on Google in real time. - Easily add special hours, your website, and phone number to keep your Business Profile up-to-date. 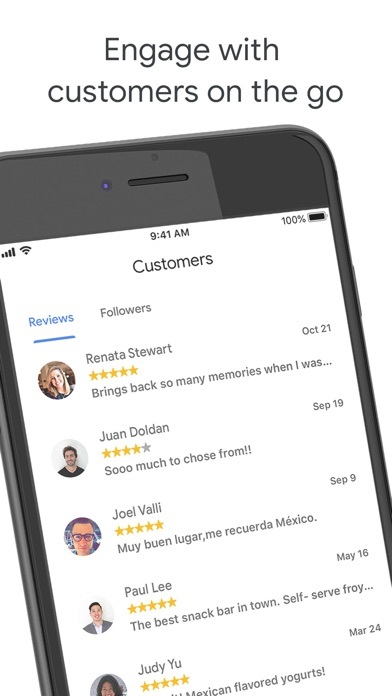 Easily connect with customers on the go: - Respond to reviews, message your customers, and see your followers in the Customer Tab. 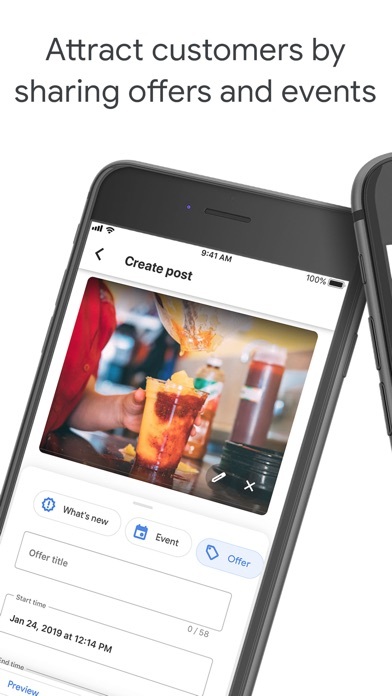 Share with customers what makes your business unique: - Upload photos and add filters to attract customers who search and find your Business Profile. - Post offers for your product or services, upcoming events, and deals. 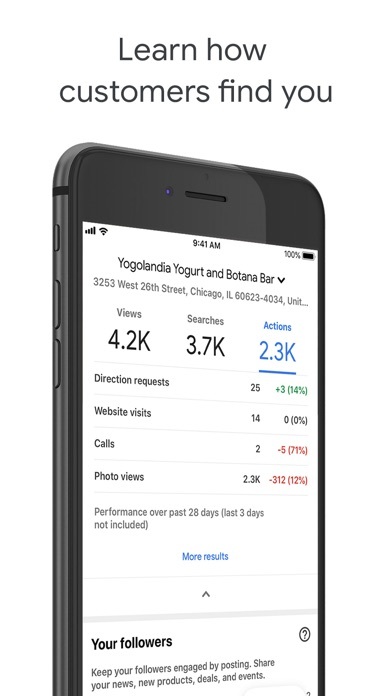 Get insights on your business: - See insights on how customers find and engage with your Business Profile online on Google Search and Maps. - Receive real-time notifications and updates to keep track of your customers on Google. More features on Google My Business: - Create a free, mobile-friendly website that works hard for you in the app. It is a sad day in age how these apps can allow cyber bullying and have people make up fake stories and allow them to stay active posts to harm business. Google and yelp need to take responsiblity and do better at investigating items when owners request a dispute. Reviews have the potential to push revenue away from business’s and should not be taken lightly! I like the ability to manage things on an app. I like the ability to respond to reviews. I do not like the repeated verification process. Its very slow and everytime google/the app makes me do it, I never recieve the letter without requesting a second time. To top it I received a call from a "google rep" yesterday. She said there was some things to finalize to get my business posted on google search queries. I gave her the information (nothing personal or financial) thinking that things would be easier afterward. Then this person said I need to pay somewhere in the three to four hundred dollar range to get listed. I declined to pay and left the call. Now not two days later Im being bombarded with phone calls to try to sell me on paying to get listed apparently. I believe I deserve better and more professional service. Frankly I dont even know if this number calling me is even a google rep. Sharpen it up please! I enjoy the stats, but There is no direct, friendly way to send a link to our renters and invite them to post a review of their stay. Or if there is, it is not easy to find. I have taken so many classes on this subject and now there’s a app. My kid now has own business with 14 reviews already! The app is great. Buried in the support tab is the ability to get a call back from Google My Business. Not sure why they bury it. But if you need help with your listing start there. We noticed in increase in website visitors immediately after creating our GMB account. The only thing bad I have to say about it is that it was kinda difficult/confusing to set up both of my websites on the same GMB account. Aside from that one flaw, this app is very user friendly. I would strongly recommend this app to anyone that owns or manages an online or brick and mortar storefront. I give it a 4.5/5 stars overall, but I’m rounding up since the difficulty I had was my own. The google app review its much more better from yelp: 1.its free (tell free if u don’t pay yelp u dent get nothing! You’re barely going to found your business. 2. U get more results compared to yelp. 3. Get free organic ads 4. Don’t think twice! Google for your business!